eat run sail: Logging Some Miles, and a Confession! First, I have to admit that I did not do my Kathy Smith workout twice last night as I said I would.... I went through it only once and then stretched for a total of 20 minutes. But that's okay, cause while I was running today, I could feel that I did work my abs! The point of today's run was just to get out there and log some miles. We are only running twice a week right now cause it is just so cumbersome to run in the cool weather while we are staying on the boat. So one more run either Sunday or Monday and that will be it cause we move mid-week to the house we will be staying at for several months. More about that in another post. I packed a 1/2 litre bottle of water and some CLIF SHOT BLOKS for us to share along the way. I really like these BLOKS and hope I can find them here in Canada. They are tasty, easy to chew, and don't have to be washed down with water. So off we went, and I reminded The Captain that it was supposed to be a slow run today... about 12 or 13 times! My slow pace is difficult for him as it is just barely more than his fast walk is and so I pushed myself a wee bit ... enough that he had to do a very slow run most of the time. We ended up along the waterfront today. It was a nice, but cool, day. And as we approached the marina, almost done, the breeze picked up a bit and it was darn nippy. I was really glad I had my jacket on as I could tell that underneath it, my clothes were drenched with sweat, and I was starting to feel cool. We did a good stretch and then peeled off our wet duds in the cockpit before coming below to enjoy the chocolate and banana smoothies I made. I was really glad I had taken the time to lay out all the ingredients for them before we ran, even plugging in the immersion blender and measuring out 2 servings of chocolate protein powder. Mmmm. We really enjoyed our hot showers today! great job on the run! Isn't it astounding how our confidence can fault us as we run with someone we know is faster? Just keep going! I bet the water at the marina was beautiful today. I miss the ocean so much! I get clif bloks off amazon, can they ship to you? I agree they are awesome! lol the Captain sounds like someone I'd like to know. lol my "slow" runs never turn out as slow as they should be either. I wish my husband would run. He used to in high school but now doesn't have any interest. You are so right about the confidence in your final statement. Thanks for that reminder! 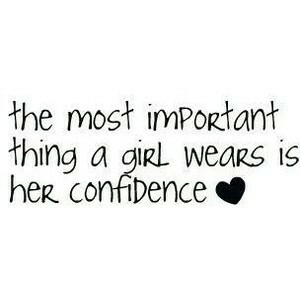 Great quote on confidence! I use the BLOKS as well for fueling, they just settle better in my tummy and are easy to eat/get down while running. Allan always fusses at me when we are "fast walking" because he's a little shorter than me and claims my gazelle legs leave him in the dust. Get him running though and he doesn't know a "slow pace". Can't wait to hear about your plans for the winter! Love that quote! (And you will see why soon!) ;) You do wonders for MY confidence, Elle!